Two months ago I dreamt up the idea of wedding invitation coasters for my cousins wedding. She loved the idea so much she decided to use the same concept for her save the dates. She also wanted to incorporate a ‘tie-the-knot’ theme so off we went to pinterest.com for inspirations. If you Google ‘save the date coasters’ I guarantee you will find this set of invitations and save the date coasters designed by Ross Clodfelter for Brittany Brown & William Goncharow and this save the date calender by Gwyneth Paige. 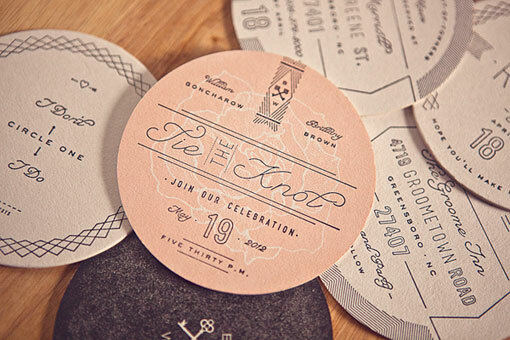 For a ‘tie the knot’ inspiration our bride-to-be loved this ‘tie-the-knot’ save the date. The design challenge lied in how to incorporate the coaster and tie the knot ideas. Stay tuned for the next steps.